Most modern cars have onboard computers called engine management systems. The engine management system communicates with sensors in and around the engine to ensure the safe running of car engine components. The engine management system or electronic control unit (ECU) also helps to reduce emissions and increase fuel economy. A cars ECU is also linked to other components around the car such as airbag sensors and brakes depending on the make and model of the car. 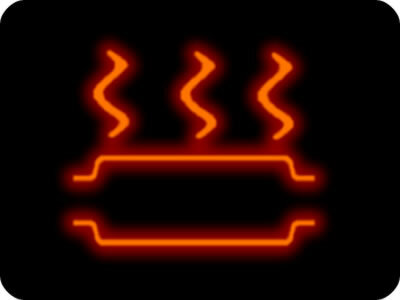 Components can become broken or worn, and when they do dashboard warning lights will illuminate on the dashboard. Some dashboard warning lights can be specific to a certain make or model of car and others can be universally recognised. Your car’s handbook will explain what all the various dashboard warning lights mean and how severe the problem could be. Below are the most recognised and typical dashboard warning lights on vehicles along with their meanings. The menu below provides dashboard warning lights and their meanings for specific car makes and models. The engine management warning light, or malfunction indicator lamp (MIL) on some vehicles may be red in colour and will illuminate when the ignition is turned on and should extinguish once the engine has started. If once the engine has started the engine warning light remains illuminated, it will suggest a problem with the engine. If the engine warning light begins flashing, ease off the accelerator and seek assistance immediately. The oil pressure warning light will illuminate upon switching the cars ignition on and will extinguish once the engine has started. If the light remains on when the engine has started or illuminates whilst driving, stop the car and turn the engine off as soon as possible. Check engine oil levels are sufficient (see Show Me Tell Me for assistance). Driving with insufficient oil in the engine can cause fatal engine damage. If engine oil is correct, do not start engine and seek assistance. See how to check engine oil for a complete in-depth guide on checking your car’s engine oil and topping up. The battery charge dashboard warning light will illuminate when the ignition is switched on and will extinguish once the engine has started if working correctly. If light does not illuminate when ignition is switched on, illuminates after engine is started or whilst driving, the battery is not charging. The possible causes could be a dead battery, faulty alternator or lose or corroded connection on the battery terminals. 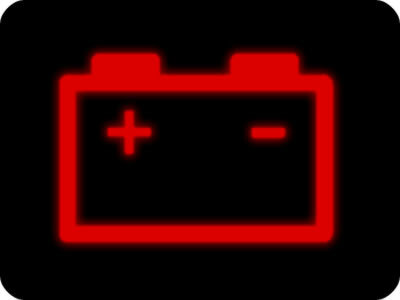 See Why is the car battery light on for further information on what to do. The brake system warning light will illuminate when the handbrake / parking brake is applied and should extinguish once the handbrake is released. If the light remains on and the handbrake is released it indicates a problem with the braking system of the car. Check brake fluid levels are at correct levels and if light remains on, mechanical assistance should be sought immediately. For further information on the possible faults, see why is the brake warning light on? 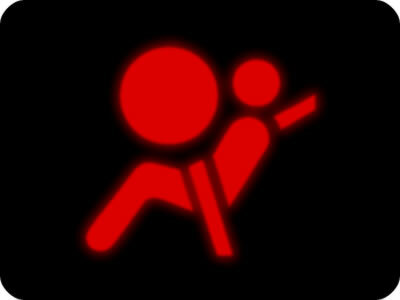 This is the dashboard parking brake warning light or handbrake warning light. These lights can be either red or orange depending on the make of the vehicle. The symbol is illuminated to warn the driver that the parking brake or emergency brake is engaged and must be released before driving off. 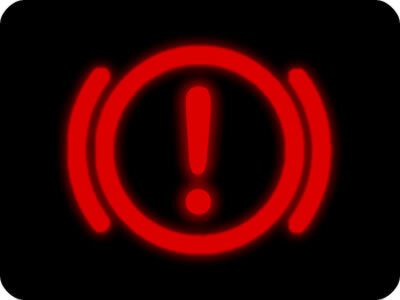 A parking brake warning light may also have a wrench or spanner illuminated underneath which suggests electronic parking brakes need servicing. If the light is illuminated along with a spanner or wrench, the vehicle can be driven safely but requires maintenance. 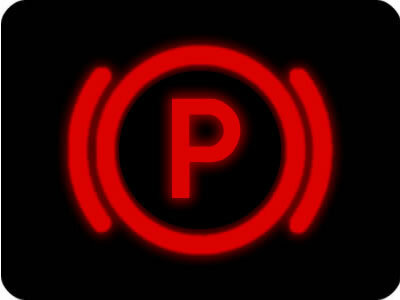 If you experience issues, see: Parking brake light stays on while driving. 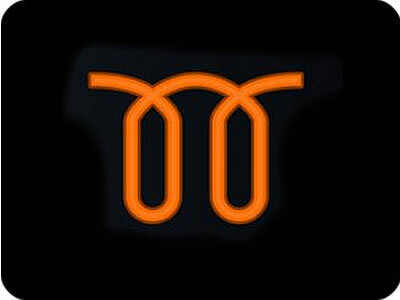 The engine overheating symbol will illuminate if your car engine becomes dangerously hot. An overheating engine can seize causing fatal damage. If light illuminates whilst driving, pull over and turn engine off as soon as possible. Wait for the engine to cool down before checking coolant. Possible reasons could be blocked or leaking within the engine coolant system, or simply insufficient coolant. See what is engine coolant for a run-down on how engine coolant works, how it benefits the engine and how to check engine coolant levels. 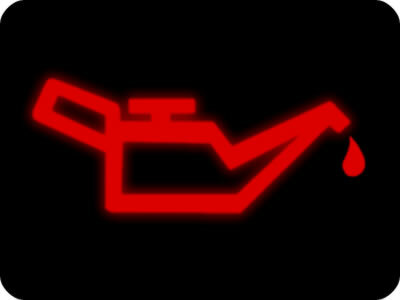 See engine temperature warning light explained for possible colours and what to do. The airbag warning light or SRS (Supplemental Restraint Systems) light will illuminate if one or all of the cars airbags have been deactivated. Check vehicle manual for any checks that can be performed. Vehicle can still be driven. 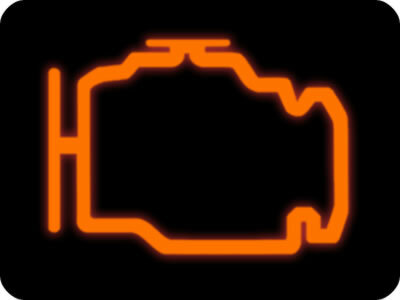 If light remains on, specialist diagnostic equipment will need to be used to diagnose faults and to extinguish the warning light. For possible airbag faults and other information, see why is my airbag light on. Seat belt reminder dashboard warning light will remain active if the vehicle ignition is on and may flash when the vehicle begins to move if the seat belt remains unfastened. An audible alarm may sound if the vehicle is moving and the seat belt is unfastened. Fastening the seat belt will extinguish the light and cease an audible alarm (if applicable). 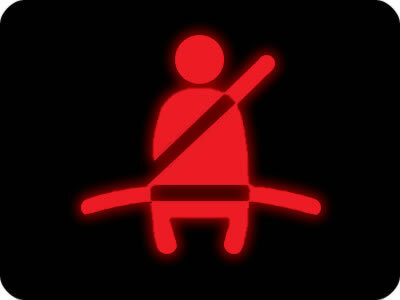 If you are experiencing problems with the seat belt dashboard light not going out, see seat belt light staying on. Some vehicles may have a catalytic converter warning symbol on the dashboard. If the light remains illuminated it could suggest a problem with a damaged, overheated or malfunctioning catalytic converter. Some other vehicles may illuminate the engine warning light id there is a problem with the catalytic converter. The engine management system may reduce power to the engine if there is a problem with the catalytic converter. The tyre pressure warning light will become illuminated when the tyre pressure monitoring system detects a tyres pressure is reduced by 25% or more. This dashboard warning light is more frequently illuminated during cold winter months when outdoor temperatures are reduced and lowering the tyre pressures. 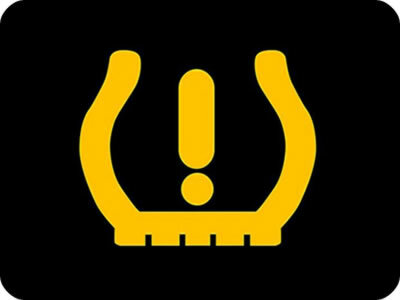 If you are experiencing problems, see tyre pressure warning light keeps coming on. The full beam symbol lets you know when your cars headlights are turned to full beam. 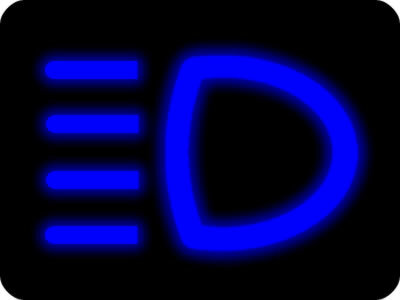 The fog lights dashboard symbol illuminate to tell you that your fog lights are on. It is a legal requirement that rear fog lights are illuminated and should be illuminated when visibility is less than around 100 metres. It is an offence to illuminate fog lights when conditions do not call for their use. The rear windscreen demister light may illuminate on the dashboard or on the demister button itself. Light symbol only illuminates when button is manually activated. 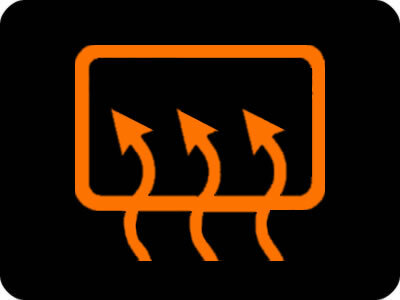 The window demister system can consume a large proportion of the batteries energy if activated for long periods. Turn off once window is clear to save battery energy, which in turn saves fuel. The power steering warning light will illuminate if your fluid levels are low or if there is a fault within the system. Check power steering fluid levels and top-up if necessary. If fluid levels continuously fall, there may be a leak in the system. Steering is possible without the aid of power steering although may become difficult at low speeds. If power steering dashboard warning light remains illuminated after replenishing levels, contact your dealer. Diesel engines require glow plug to heat the engine cylinders before starting. 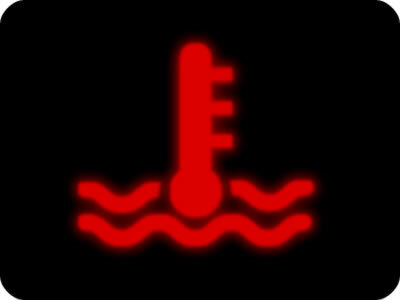 By turning on the ignition, the glow plug symbol will illuminate and extinguish once enough heat has been applied. Trying to start the engine, especially in cold weather will be problematic if either you do not wait for the light to extinguish or there’s a fault with the system. If the glow plus light does not come on at all or it flashes, it will indicate there is a fault with the glow plug itself, wiring or fuse. This is an information light to signify that your indicator is on or that you have activated the hazard warning lights. 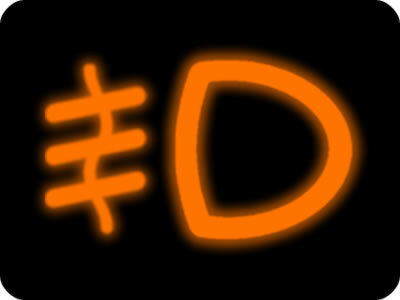 If you have a fault with your indicators / turn signal, the dash lights will often flash faster than normal. See why is my indicator flashing fast? Red dashboard warning light: A red dashboard light suggests a potential serious problem to either the vehicle or to your safety. A red warning light may also be used to remind you of an important issue. 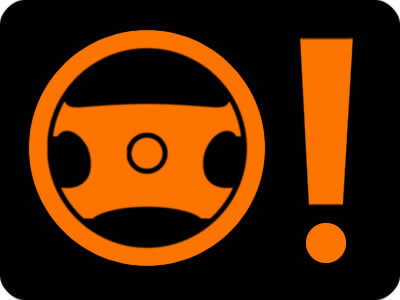 Orange or yellow dashboard warning light: A orange or yellow dashboard warning light is intended to provide the driver information that the engine or a component of the vehicle needs repairing or servicing. Flashing dashboard warning light: A flashing dashboard warning light is used to inform the driver of a state of urgency that the engine or component of the vehicle needs repair or replacing. 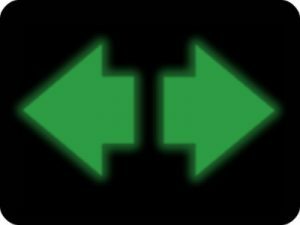 Green or blue dashboard lights: Green or blue dashboard lights are for informational purposes to inform the driver that a system or utility is in operation. On a Mercedes 118 it is usually the cruise control set for a low speed,IE:30 mph.on the loan car I am driving it can be set for 20/25/30.etc. I have Mercedes benz S350L model 2007 , what mean Sign D ? I think it’s a general fault light – non-specific. Hello I have a Renault clio 2008 what can mean on dashboard a sign with car and a arrow pointing on front of it?